If they did, then they renamed it back. I vaguely recall that it was included in the 3rd installment of the Planescape Monstrous Compendium (also known as "The one that wasn't as good as the first two"). In a fascinating display of multiversal resonance, the name "oortling" is EERILY SIMILAR to Dutch astronomer Jan Oort, a man who did a great deal of research on comets, and for whom the Oort cloud is named. 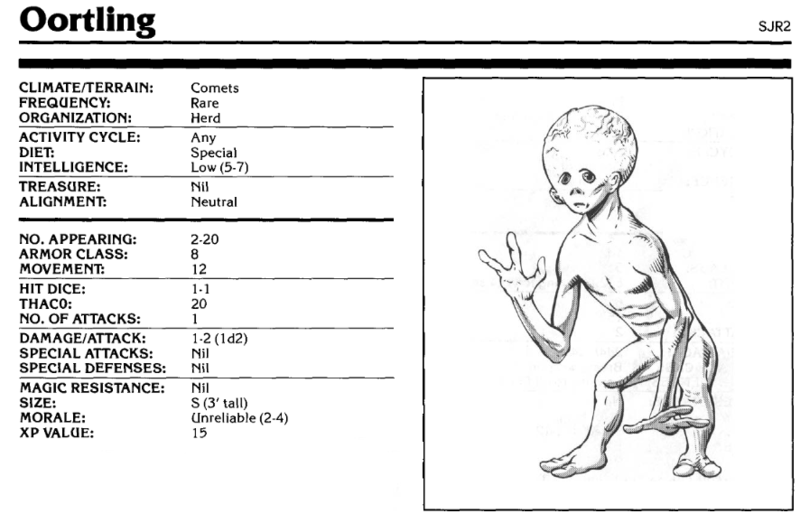 Furthering the incredible coincidence, the oortlings live on comets. What are the odds? This is what happens when you break the fourth wall and let Elminster run around Ed Greenwood's living room. The primary purpose of this entry seems to be reinforcing the fact that the mind flayers really are utter bastards. Oortlings are completely non-hostile unless maddened by extreme pain or some similar provocation. The mind flayers have bred almost all traces of violence out of them. So they are unlikely to be a threat to a PC party unless the PCs happen to be in the way of an oortling stampede or something. The brains of the oortlings are well-developed and oortlings have the potential to be incredibly intelligent indeed. However, the illithids deny them all forms of education, so their potential avails them naught. However, if some enterprising adventurers were to rescue some of them and send them to boarding school, no telling what kind of Einstein they'd get back. The text says that oortlings only eat cometary ice and cannot survive on any other food. Which doubtless makes raising them a bit tricky. They had a vibrant culture at some point in the past, before the illithids got ahold of them. Impressive structures were carved out of the ice of their cometary homes, and each comet in Realmspace housed an oortling village or two. But then the mind flayers came and completely subjugated the oortlings, and now they serve no purpose other than stocking the larders of mind flayers throughout the known spheres. Nonetheless, it's not beyond the realm of possibility that a party of adventurers might run across a well-preserved pre-illithid oortling town. Or even a hidden enclave of pre-subjugation oortlings who have not yet been devolved by the mind flayers. This is the third critter from Anadia developed in the Monstrous Appendix. The rest of the system gets short shrift. The Sun gets two critters; Karpri, Chandos, and Coliar get one critter each; and Selune, Glyth, Garden, and H'Catha (to say nothing of Toril!) get left completely out in the cold. 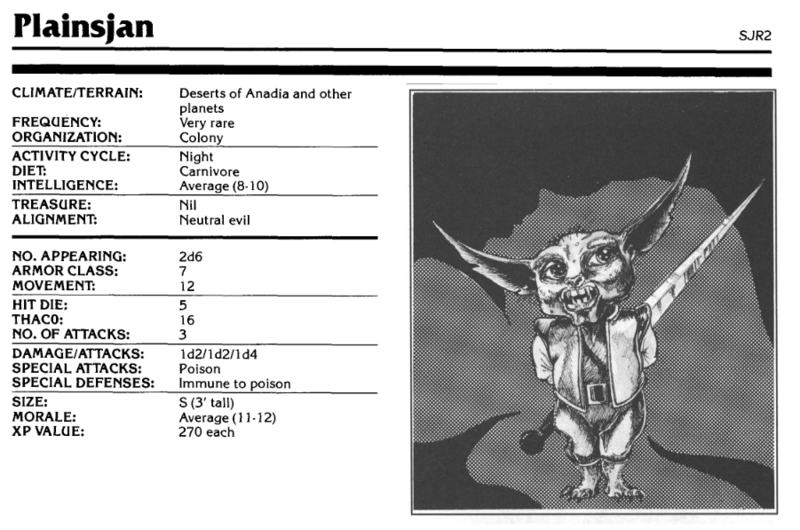 The plainsjan makes me think someone was watching a rerun of Gremlins when they came up with this critter. Probably just the art, because the text doesn't draw any obvious parallels. The text says that the plainsjan has "little" pointed ears, like elves. The ears in the accompanying picture are not, I submit, "little". Plainsjan subsist primarily on umber hulk meat, which is kind of an interesting dietary evolution. They'll eat other stuff (including humans and demi-humans) if they get hungry enough, but umber hulk meat is where it's at, plainsjan-wise. They have sharp claws that cause additional bleeding damage, and they like to attack with superior numbers. The picture makes it look like the plainsjan was caught red-handed trying to open someone else's mail. Does the Plainsjan get any immunities/bonuses to hunt and kill Umber Hulks? Seems like a highly-specialized target. I thought the same thing. They should get a bonus to their save vs. umber hulk confusion rolls or something. But apparently they just rely on the old fashioned Zerg rush.